Revealing her homosexuality in 1997, comedienne Ellen DeGeneres gained recognition starring in ABC's series Ellen (1994-1998) and hosted her own show on CBS, The Ellen Show (2001-2002). She also wrote the No.1 hit book, My Point...And I Do Have One, which was published in 1996. Blonde-haired, blue-eyed DeGeneres has been involved personally with actress Anne Heche (1997-2000) and is currently in a relationship with Ally McBeal actress Portia de Rossi after splitting from her four-year-girlfriend Alexandra Hedison. Recently, de Rossi had been reported to have given Ellen a wedding ring as a symbol of their commitment. Despite the couple's vow, DeGeneres was rumored remaining close with ex-girlfriend Hedison, DeGeneres commented, "I still love her and care tremendously for her. And it's important to add that we have every intention of being in each other's lives." Born on January 26, 1958, Ellen Lee DeGeneres is the daughter of devoted Christian Scientist parents Elliot (insurance salesman) and Betty (real-estate agent). Born in Metairie, Louisiana, DeGeneres moved with her mother to New Orleans at age 13 after her parent's divorce. At age 18 she revealed her lesbian status to supportive mother Betty. DeGeneres has one brother, TV writer Vance DeGeneres and two stepsisters. She attended Atlanta High School in Atlanta, Texas and studied for a semester at the University of New Orleans. She is a fan of cheese pizza, ice cream and Cheetos and owns three cats and two dogs, Bootsie and Muffin. Doing such odd jobs as waitressing, selling vacuums, painting houses, and being a legal secretary, Ellen DeGeneres finally managed to share her sense of humor as a slapstick comedian. While working as an MC for Clyde's Comedy Club in 1981, she recorded her club performances and won Showtime's "Funniest Person in America" in 1982. As she gained fame, DeGeneres flew to L.A to shoot the HBO Specials "Young Comedians Reunion," "Women of The Night" and "One Night Stand," the latter of which earned her a Cable ACE Award nomination. In 1986, she landed a significant career boost with regular appearances on the hit comedy show The Tonight Show Starring Johnny Carson. Her witty humor scored follow-up performances, notably The Late Show with David Letterman, The Tonight Show with Jay Leno, The Oprah Winfrey Show, Later with Greg Kinnear, Larry King Live, and Good Morning, America. Her rise also included ABC's PrimeTime Live and the documentary Wisecracks (1991). DeGeneres took her first acting work on television with Fox's Open House and continued with ABC's Laurie Hill. In 1994, ABC offered her the chance to star in their show, These Friends of Mine, which later was renamed to Ellen (1994-1998). The show proved to be an ultimate breakthrough since it topped cable ratings and eventually handed her two Emmy nominations. The runaway success of Ellen led her to host CBS's The Ellen Show (2001-2002). The show maintained high ratings in spite of some opposition to her announcement that she was a lesbian. About Ellen's brilliant comedy performances, People magazine wrote, "With her pop-eyed innocence, her self-aware goofiness, DeGeneres is a sitcom natural. She has an endearing way of putting her foot into her mouth and then wedging it in deeper and deeper as she babbles on embarrassedly." On June 28, 2003, HBO aired the hysterically funny Here and Now, a tape of DeGeneres' stand-up comedy tour. 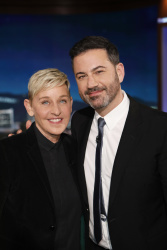 DeGeneres has also hosted such high-profile events as the 38th and 39th Annual Grammy Awards, the 46th Annual Primetime Emmy Awards, the VH1 Honors, VH1's Diva's Las Vegas and The Saturday Night Live Christmas Special. Playing a bit part in her first movie Coneheads (1993), DeGeneres won a leading role in the romance-comedy movie Mr. Wrong (1996, costarring Bill Pullman) and was later cast as Sgt. Rita Pompanoin in Goodbye Lover (1998). She also worked with Matthew McConaughey in Edtv (1999) and did a love scene with Sharon Stone in the beautifully written If These Walls Could Talk 2 (2000). In 2003, she lent her voice as fish Dory in Disney's box office animated movie Finding Nemo and will star in the upcoming comedy Oh, God! (2005). A great fan of comedian Bob Newhart, Ellen DeGeneres wrote the hit book My Point...And I Do Have One (1996) and subsequently launched her comedy album Taste This (1997). She also released her hilarious short stories and essays in her second book, The Funny Thing Is..., published by Simon & Schuster. "I've always wanted to get to Celebrity Ville and now that I'm here, I realize there's no finish line. You're never satisfied. It's all about doing your best work." Ellen DeGeneres.